Powerful, interactive Color Wheel with multiple color schemes including Monochromatic, Analogous, Complementary, Split Complementary and Triadic. Custom colors can be added to any scheme to complement your harmonious palette. 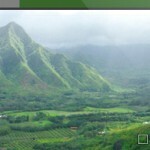 Color palettes include values for RGB, CMYK and Library values. The quick to inspire Image Picker extracts dominant colors from any photo you throw at it—from your library or from your camera. Choose from the top 16 hits, or drag the screen to add your own colors, loupe and all. 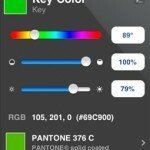 Color palettes include values for RGB, CMYK and Library values. Deftly search through PANTONE® solid coated, PANTONE® solid uncoated, PANTONE® Goe™ coated, PANTONE® Goe™ uncoated, Web Safe Colors, HTML Colors. And with version 1.1, we’ve added the PANTONE® fashion + home libraries. Swatch info includes RGB, HSB and Hex. Most libraries even include Lab and CMYK. Color Expert’s exclusive “snap & tap” technology. Just snap a photo and let your finger select that perfect color. From your eyes to the screen. 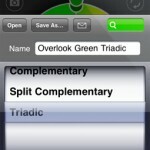 Send palettes to yourself or to friends via email. And new to version 1.1, you can use those palettes in your favorite design applications by including Adobe Swatch Exchange files. Check it out on iTunes . . . Originally published 20 Feb. 2009. Code Line has announced its Art Files and SneakPeek Pro now compatible with Adobe Creative Suite 4. Art Files is a stand-alone application that helps users gather and package Illustrator documents, linked images, and fonts for graphics files, which in turn can be archived, shared, or printed off. The software is designed for production artists who work with graphics files, and features the ability to collect several documents at once to help minimize the time spent organizing. 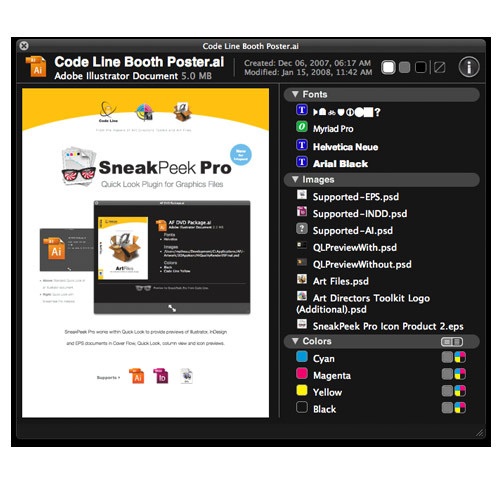 SneakPeek Pro is a QuickLook plugin that allows users to preview Illustrator, InDesign, EPS and Freehand documents without having to launch an application. In addition, people can also view fonts, images and colors that are used in CS3 and CS4 documents. Art Files is compatible with Mac OS X 10.4 or higher and is priced at $50, while SneakPeek Pro requires Mac OS X 10.5 or later and costs $20. Code Line also offers a bundle pack of both Art Files and SneakPeek Pro that is priced at $60. Any pre-existing users can download the update for free. 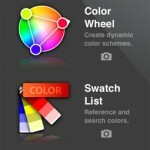 Also see Mordy Golding’s review and other apps listed in Designer Work Plan’s must have 20 iPhone apps for designers. 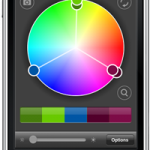 Color Expert contains powerful tools to help artists and designers identify, translate, capture and showcase color. Designers know inspiration can come anywhere at anytime. Just look around. Some of the best ideas are waiting for you in the real world away from the studio. Now with Color Expert, you’ll have the tools to capture the moment, the moment a color captures you. Look down. See the color of that Pomegranate in your cart? Go get it. It’d be perfect for the project you’ve been working on. Whip out Color Expert and it tells you that shade is PANTONE® solid coated PANTONE 220 C. The interactive color wheel then finds the perfect color schemes and palettes to match. Now, email that color scheme to your friends or clients. But, you might not want to tell them you’re still in the check-out line. Whether designing, decorating or accessorizing, Color Expert is indispensable for anyone working with color. Anywhere. Anytime. Click here for more information in iTunes. $9.99 for now. Color Expert’s exclusive “snap & tap” technology. Just snap a photo and let your finger select that perfect color. From your eyes to the screen. Powerful, interactive color wheel with multiple color schemes including Monochromatic, Analogous, Complementary, Split Complementary and Triadic. Quickly search through PANTONE® solid coated, PANTONE® solid uncoated, PANTONE® Goe™ coated, PANTONE® Goe™ uncoated, Web Safe Colors, HTML Colors. Email your palette ideas to friends, colleagues and clients. 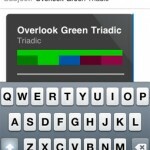 Color Expert provides a rich, HTML based email you can send from your iPhone or iPod touch.